Chess player Soumya Swaminathan (29), who holds the title of Woman Grandmaster from Bharat, has pulled out from the forthcoming Asian Nations Cup (Asian Cup) Chess Championship 2018 being held in Iran, as Iranian law makes the headscarf or hijab compulsory for even visiting sportswomen & dignitaries, including non-Muslims. On her official facebook page, Soumya has written that being forced to wear the headscarf or burkha is a direct violation of her basic Human Rights. She has also criticised organisers and sports officials for organising the tournament in a country that enforces a religious dress code on sportspersons. Soumya Swaminathan further mentions that representing Bharat is always a huge honor for her but “some things simply cannot be compromised.” On one hand where feminists openly praise ‘Hijab’ as one’s choice, despite it being a religious compulsion, one must applaud Soumya for taking a stand on something that goes against her freedom, religious and cultural choice. It must be noted that in recent times in Iran, there have been mass protests against the Islamic theocratic government in which some women pulled off their hijab, waving & burning the hijabs to show their frustration with suffocating sharia law. #Tehran: This woman standing in a busy street WITHOUT her oppressive headscarf. In Feb this year, many women protestors in Iran and other parts of the Muslim world took to celebrate #NoHijabDay. Islamic bigots have hardened attitudes to such an extent even in a secular, Hindu-majority country like Bharat that Muslim youth feel emboldened to denigrate the achievements of even an Olympic-medal winning athlete like wrestler Sakshi Malik for ‘exposing her thighs and chest to the world’. 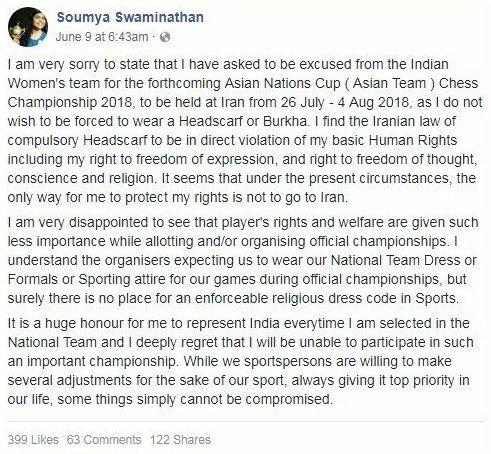 Hats off to Soumya Swaminathan for pulling out of this event in Iran. Back in 2016, Bharat’s Heena Sidhu also bowed out of the Asian Airgun Shooting Championship that was held in Tehran, Iran, on account of Iran’s strict dress code for women that involved wearing hijab. It is really commendable to see these strong, rooted women standing up for their rights and freedom, when the liberal elite have meekly caved in to Islamist forces . Encephalitis deaths drop by 66% in East UP – no credit to Yogi Adityanath, who was vilified in 2017 for this very issue? What Does Opposition Have to Offer in LS 2019, Except ‘Defeat Modi’ Call?